There’s a strong waft of paint fumes coming from creative arts. But it’s not what you may think. There’s not a pot to be found in the top-floor studios, the raw materials packed away as the year closes on classes. No, the chemical scent is straight from a 10-litre tin of white wash ‘n’ wear being rolled on plinths and make-shift walls. It’s all action stations in the Phyllis Palmer Gallery, as staff and students prepare for Friday’s graduate exhibition opening. It’s the final hurrah for third-year students and a chance to show their work to family, friends and Bendigo’s arts community. “It’s bitter sweet,” says Edwina Combe. “It’s a show where we’ve got to some sort of resolution. I’m sad to leave to but I’m also happy to leave and take a break, because I came straight to uni from high school. Edwina has been wrangling a projector in place to display her photographs. The digital images will be surrounded by prints; old-school analogue style. “The analogue photography makes a lot of people feel very nostalgic,” she says. And for others, confused. Edwina was recently working with a group of Year Seven students when they asked if they could see the photo she’d taken on her film camera. “I said, ‘no, you can’t, it has to be developed, that’s the way it works’. They were very interested in why I’d want to use them,” she says. Many of Edwina’s photographs are taken on disposable cameras, which she takes apart, modifies, and puts back together with duct tape. She experiments with scratching, reversing or changing the lenses, then develops her own negatives in the darkroom. For Tashara Roberts, the process of making her grad show pieces took several months and lots of baggage; literally and figuratively. “This is an exploration of a place,” she says of the huge photographic prints now hanging in the gallery. It’s a place most locals would know well, but it’s hard to recognise distilled like this, into clusters of cigarette butts, beer can ring pulls and broken glass. “We were given an assignment to photograph a place and I became a little bit obsessed with it,” Tashara says. 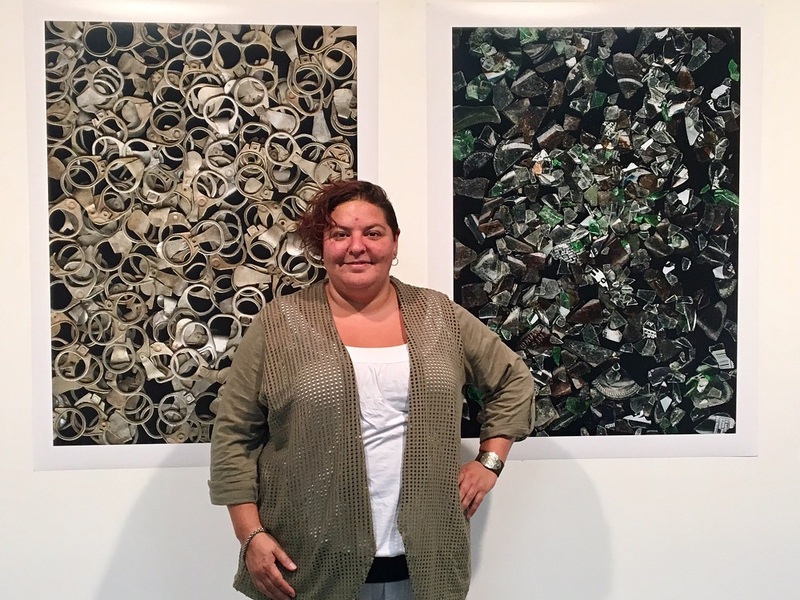 She says most of the litter was found around the boat ramps, but she’s tried to juxtapose that with natural elements of earth and leaves. Joanne Osborne came to La Trobe as a mature-age student three years ago. “I was working as an engraver and I just thought, ‘I’ll never get anywhere doing this’. I rearranged a lot of things in my life to come here,” she says. Joanne quit a full-time job and moved to Bendigo, far from family and friends, who thought she was “bonkers” for doing so. But not Jo. 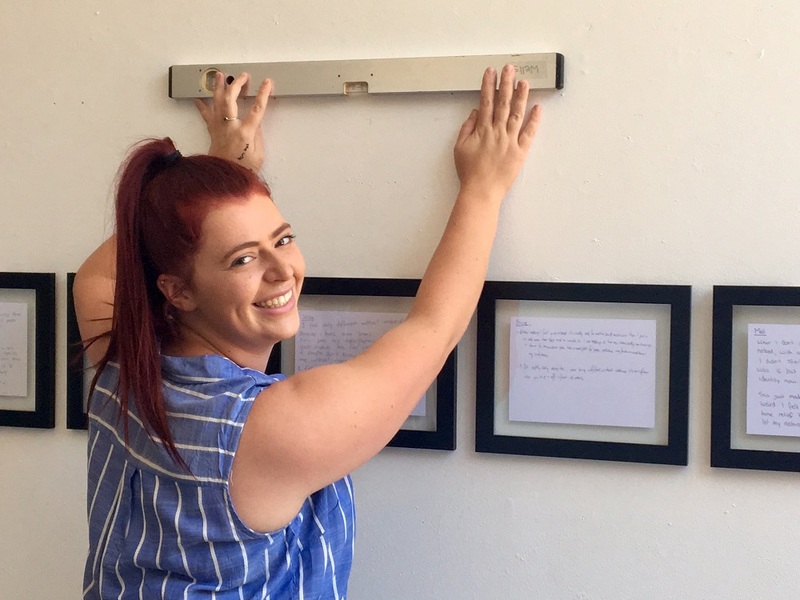 She says three years of study has helped her develop a disciplined practice, which she aims to keep fostering through an Honours year in 2018. Take the stairs beyond the gallery and you’ll step into the technicolour world of Sarah McDonald. Her paintings are taking up the largest wall on the top floor, closest to the sun. They’re likewise bright and life-affirming. “An entire year’s work is what this boils down to,” Sarah says. “The big painting in the middle was my last piece of the year. You can see my style has definitely changed from more detailed works into something more gestural. 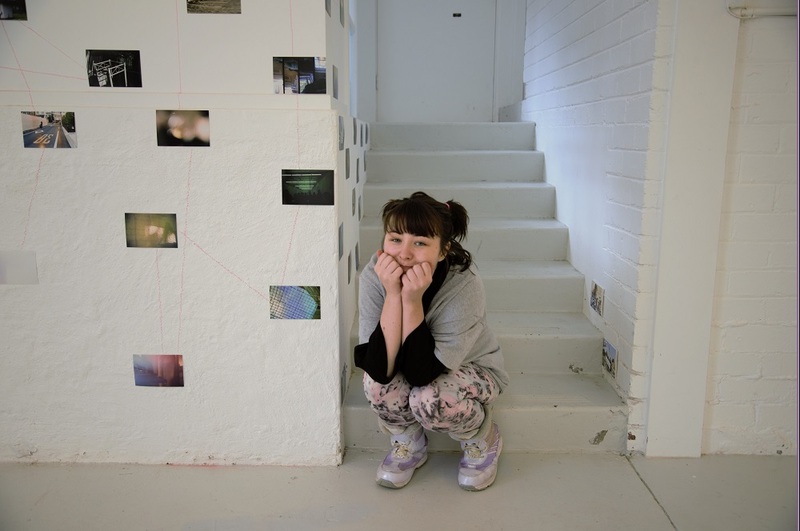 Sarah may be farewelling her studio space, but she’ll be back at La Trobe next year, pursuing a Master of Teaching. “I always wanted to be an art teacher,” she says, crediting Crusoe College’s Miss Spencer-Jones for the inspiration. 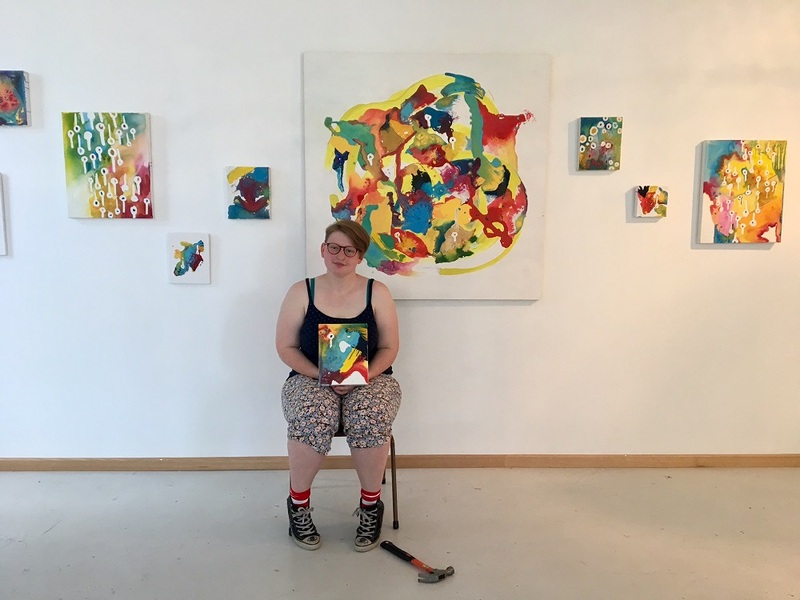 Melissa Wells is installing her mixed media work, collectively titled ‘Unmasked’. It consists of written and framed statements of young women’s thoughts on makeup, plus video footage of girls removing their daily ‘masks’. “I’m trying to emphasise that makeup is not what makes us beautiful,” Melissa says, enlisting young women aged 18 to 25 to help with her project. Melissa says the idea came from being part of a production this year, and watching the actors remove their makeup in order to step away from their stage characters. It dawned on her, that’s what many women are doing every day. 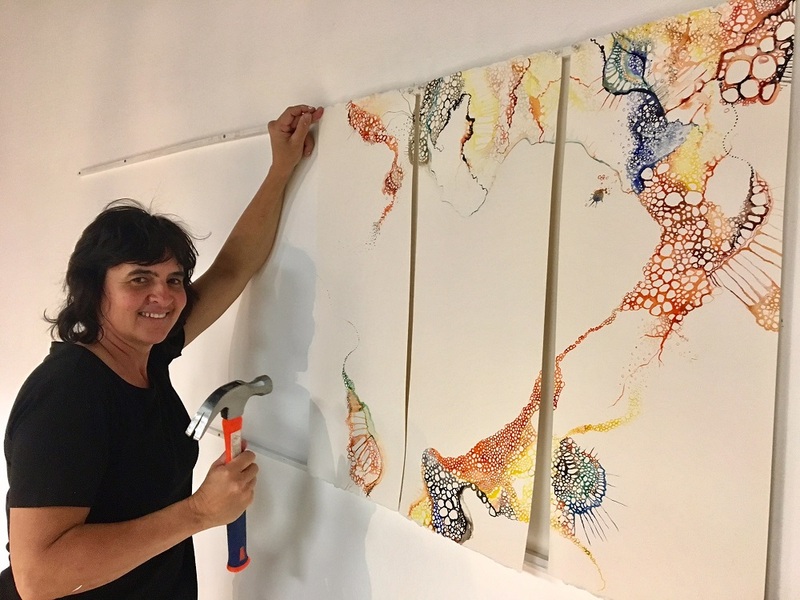 “The course has been really good but I’m excited to move onto the next stage now,” she says, adding it’s time to feed her inner-artist with some overseas travel. The graduate art exhibition will showcase the works of visual arts, photography and graphic design students. It opens on Friday, November 17 at 6pm and the works will remain on show in the Phyllis Palmer gallery until November 20.